This beautiful yacht is priced to sell and in showroom condition, with only 178 hours on her twin turbo diesel 370 diamond series cummins motors which are controlled by electronic throttles, thats bow and stern thrusters! She has 2 staterooms w/TVs & 2 heads with separate showers. The rear stateroom has sliding glass doors with a dramatic entrance to a rear cockpit deck, with BBQ grill, swim ladder, shower, and davit system. 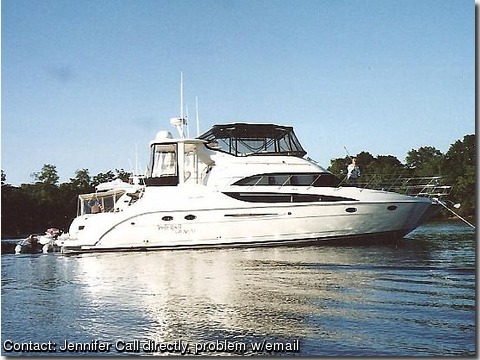 There is a full galley w/fridge, 3 burner stove, convection/microwave oven, sink, & coffeemaker. The full beam salon area has 3 lounges, sofa & table/cocktail table, entertainment area w/TV, DVD/CD player, & surround sound. Also has a diesel 11.5KW gen, full Raymarine Package, radar, depth, compass, GPS, auto pilot, 2 VHF radios w/ram michrophone, air/heat, and 4 season heat, Reverso fuel polishing system, oil changeing system, bimini & isen glass, docking on command w/bow & stern thrusters. Aft deck, has a wet bar w/icemaker. Fresh bottom paint & new zincs. Washer/Dryer by Spendide new in 2006, heaters in every room for the winter with upgraded electrical panel done in 2006. Seadome on top for TV reception wherever you go, new in 2007. Do not let the low price fool you, the only difference between this vessel and a new one is all of the upgrades!